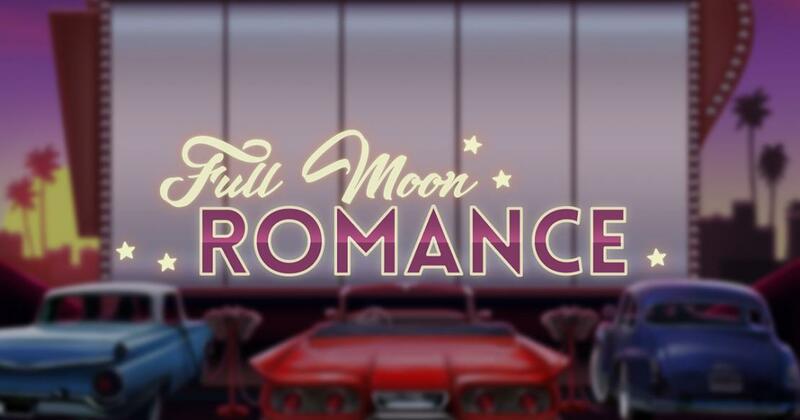 Full Moon Romance is a game that Thunderkick created with a romantic theme in mind, one that relies on a 50s style of design. Thunderkick has a knack for creating excellent slot machines, and Full Moon Romance is an example of the kind of high end titles they usually put out. The graphics are all high end here, and even the poker icons don’t bother me as much in this case. The action revolves around a couple that’s in love, going at an open air cinema in their car. Apparently, they’re also turning into werewolves when the Full Moon is out. Based on the style of the design, we can safely put the action of the game at some point in the 50s. The reels look like they’re part of the theatre’s big screen, and they host symbols that range from the aforementioned poker cards, to bouquets of flowers, the Full Moon, the girl and the boy and a dog collar marked Puppy Love. You should expect to have 15 active lines and 5 reels to spin. The game will give away prizes of up to $1,500, while the average Return to Player is expected to hover at the 96.1% mark. Among the features I would count the stacked Sweetheart icon, the Clone feature, the Full Moon scatter, free spins and wild symbols. The game might have 15 fixed lines, but the bets you’re placing don’t have much to do with that number. All Thunderkick slot machines have the same betting range, with fixed values ranging from $0.10 to $100 for you to choose from. You don’t have to calculate the line bet either, since the slot automatically changes the values on the paytable, depending on the total bet. The most regular feature you can use is the wild, sporting a very simple logo of its own. It’s just a simple substitute, one that is not useful where the scatter is involved. A Full Moon scatter icon will also be of help to you, used as a trigger for the free spins feature, offering between 10 and 20 rounds. Another symbol to pay attention to is the Sweetheart icon. It’s a stacked symbol, occupying three positions when it’s fully visible. It shows either the Girl or the Boy in its image. The free spins transform them into Werewolves and at that point they’re considered the same type of symbol. The Clone feature starts when the Sweetheart icon occupies the entire reel 1. It will create up to four extra clones on other reels. Thunderkick has created yet another high quality game in this case, the features and graphics contributing to it.